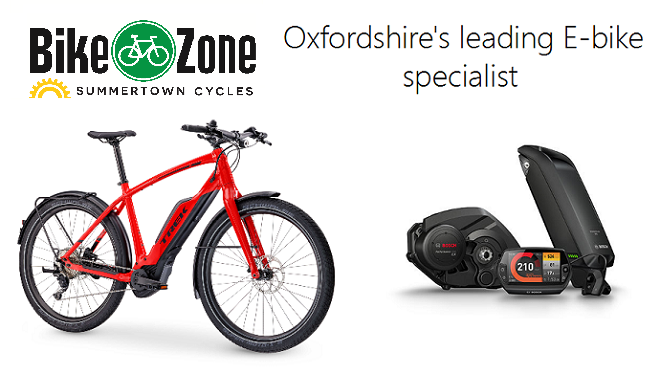 We are Oxfordshire’s leading E-bike Cycle stockists. As an interdependent bike shop we have embraced the electric bike as we do with any other type of bike, and unlike many traditional bike shops we offer a wide range of E-bikes on our showroom floor ready to ride. E-Bikes are all about getting on and having a go. With several motor options ranging from wheel motors to centre driven crank motors, plus a selection of different manufactures such as Bosch, Shimano, Yamaha and Wisper there is no one correct bike for everyone as each has their own strengths. Give us a ring and book in for a test ride. We want to get you riding our bikes because this allows you to see the differences between them. Bring a form of photo ID (driving licence or passport) and a credit card for us to hold while you are on a test ride and we will happily let you take the bike out for a spin. We also offer an option where we take you for a local Oxford ride lasting about half an hour giving you the chance to try out some hills ( E-bikes only), this way you can try multiple bikes back to back as we can swap over mid ride. This also allows us to show you how to get the most out of am e-bike in real world usage (by appointment only).